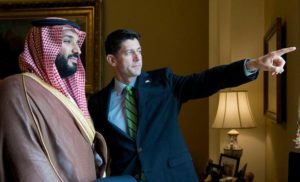 Deputy Crown Prince Mohammed bin Salman’s high-profile US visit is very important in political, economic and security terms. Saudi Arabia and the United States are longstanding allies. They have not always seen eye to eye. Few allies do. But the strength of their alliance has always seen these differences overcome. There have been differences over Washington’s rapprochement with Iran which the US did without taking into account Tehran’s foul play in the region. The move emboldened Iran which continues to meddle in the affairs of its neighboring countries. Saudi Arabia also urged Obama’s early intervention in Syria. The US administration chose to ignore the advice. The resultant ruin of Syria has destroyed the lives of millions.It has flooded neighboring states with refugees. It has built a comfortable nest for Daesh terrorists. In Yemen, the Kingdom had to act to check the Iranian-backed Houthi insurgency and restore the legitimate government through Operation Decisive Storm.Unfortunately, Washington has wanted to believe the government in Tehran is part of the regional solution. The fact is, Iran is, along with Israel, the core regional problem. Despite these differences, the Saudi-US ties remain robust and the visit of the deputy crown prince for the third time testifies to that. 1.What are the importance of Saudi Arabia and U.S.A longstanding alliance in these aspects? 2. The alliance of U.S.A and the Kingdom of Saudi Arabia surely motivate threat to other countries. 2.1 What are the direct threats to both countries? 2.2 What are the indirect threats to both countries? 3.What are the causes of insurgency in Syria, Yemen, Tunisia and Libya? 4.Meddling or spying into country’s both internal and external affairs is one of the arranged-dispute against Great kingdoms of Arab Nations. How could the Great Kingdom of Arab Nations send away all foreign meddlers or foreign spies?